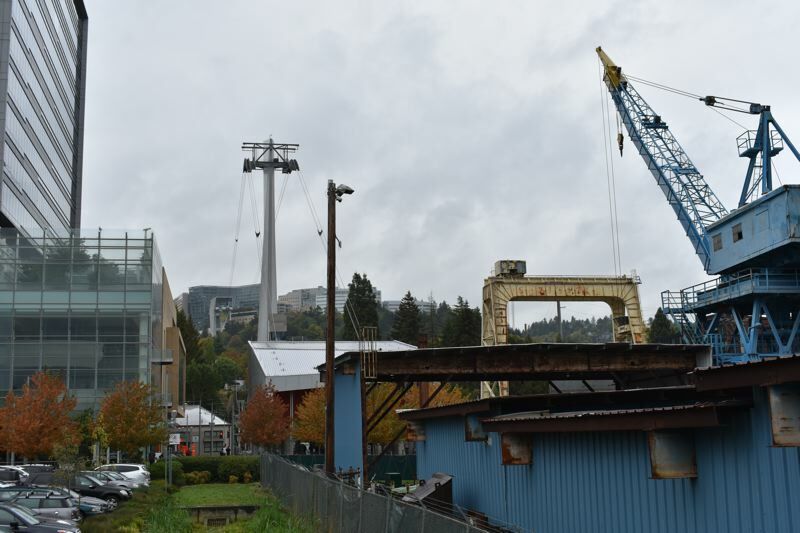 Zidell family moves from heavy metal into mixed use development in tony South Waterfront. 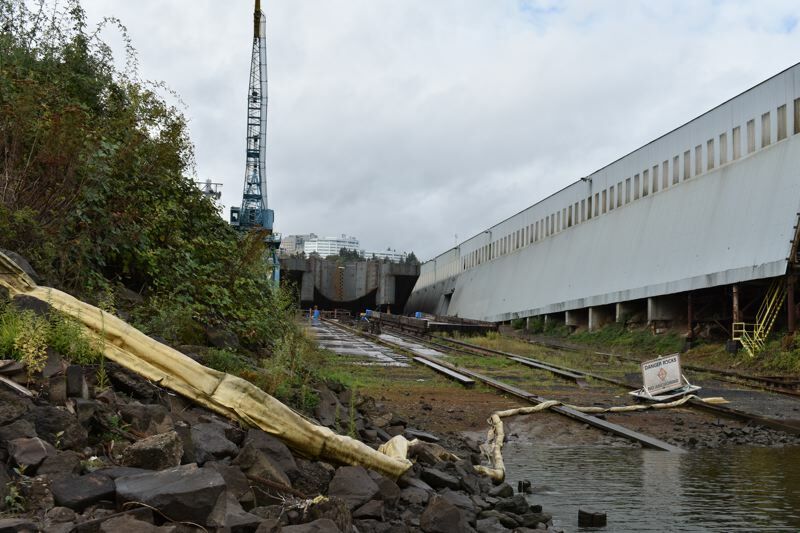 When Jay Zidell announced his family is getting out of the barge building business two weeks ago, it was a big, steel nail in the coffin for old Portland. The South waterfront site around the west end of the Ross Island Bridge was once home to ship breakers owned by the Zidell and Schnitzer families. While the Schnitzers have gone full bore and donated much of their adjacent parcel of land to Oregon Health & Science University, for the Collaborative Life Sciences building and the Knight Cancer Institute, Zidell Marine Corporation has one more barge to build before they shut up shop in mid 2017. Then they will focus on real estate, through ZRZ Realty Company, which is run by Jay Zidells nephew Matt French. Shipbuilding gave way to barge building, which has given way to jogging surgeons and dental students on race bikes. The next part of the plan is to clean up the site of the long, blue barge building where the barges are made and fixed. This would complete the clean up of the rest of the 33 acres the Zidells own. That land makes the Zidell family the largest owner of undeveloped land in South Waterfront. These 33 acres are a subset of South Waterfront, which is 120 acres and is bounded by the river and Interstate 5. This in turn is a subset of the North Macadam Urban Renewal District, which totals 420 acres. Once Tilikum Crossing opened and OHSU signed on to build three more buildings, ZRZ sped up its process. It doesnt hurt that the Portland real estate market is hot right now and the urban renewal district expires in just nine years  2025. Public dollars have poured into South waterfront in the last decade. From a desolate breakers yard, it has become a transportation hub, with freeway, MAX, Streetcar and bike access all converging at the foot of the Tilikum Crossing. This has made it into a desirable area for development. Being an urban renewal district, the Portland Development Commission agrees to borrow money against future property taxes to make a patch of flood plain habitable, adding roads (such as Bond Avenue), sewer, parks and the greenway along the river. Bond Avenue is part of Phase 1 of the Development agreement with PDC and is happening right now. The Portland Bureau of transportation expects the work to go out to bid on Bond Avenue North of Porter by the end of the October. In the PDCs Development agreement of June 2015, the city promise $23.7 million so long as 1.5 million square feet of mixed-use development is built in the South Waterfront by 2025. After 2025, the PDC will still be collecting property taxes, to pay off the infrastructure or use it for some other project, but the area reverts to normal status and Zidell and any other land owner or developer is on their own. No new tax breaks, no more tax increment fund. In an interview in the Zidell offices at 3121 S.W. Moody Ave., which will be torn down to make way for a bigger office building on what is called Block 4, Jay Zidell and his real estate consultant Tom Henneberry sat down to talk about their plans. They called the 2001 master plan more of a vision document. The master plan that Henneberry is coordinating should be complete by the end of 2016. Its the same thinking as the Goodman family has about its downtown parking lot empire: if you have a great plot of inner city land that could one day be worth billions, hang on to it. Zidell says selling land is giving up control, unless you carefully select partners to sell to. They pride themselves on not doing spec buildings. Rather, they have contracted Noell Consulting of Atlanta to do a market study to see how much residential and retail the area can support. ZRZ is constantly courting tenants for its future office spaces. Jay Zidell is president of the real estate arm, ZRZ. He has two sisters, one who works for Zidell and one in Palm Springs who does not. His son is not in the business, but his nephew Matt French is managing director at ZRZ and oversees the development. Zidells grandkids are age five and nine months. Thomas Henneberry, who came on full time as Chief Operating Officer in May 2016, is used to working with families with land to develop. He spent thirty years working for the Richard Jacobs Group in Cleveland, Ohio, developing their retail shopping centers, office buildings and hotels. After that he was briefly in Columbus Ohio with another family, then it was off to Washington, D.C. and a public company, Forest City Ratner Companies, controlled by the Cleveland-based Ratner family. Portland can be like D.C. Essentially, this is what Portland can expect at South waterfront, just north and south or the Ross Island Bridge. And at least one hotel, he adds. Henneberry jokes that hes been meeting with the citys various bureaus, A cast of hundreds, about sewers, parking, traffic and more. Geraldene Moyle, Senior Project Manager at the Portland Development Commission is the project manager keeping that cast at the table. She points out that since the City doesnt own the land, like it did at Burnside Bridgehead or Centennial Mills, the Zidell process should go smoothly. Its all about matching the infrastructure with the buildings being built. may change, she says, but the code wont. Portland differs from Washington, D.C. in a few key respects: D.C.s population is 5.5 million people, the site was not already zoned whereas South Waterfront is, and the waterways in D.C. do not have so many building restrictions, and are more polluted. The biggest difference is height. D.C. is very height resistant, here is very height-friendly, says Henneberry. What about the tall condos-turned apartments that stood as a monument to the great recession? Henneberry doesnt expect they will be building that tall any time soon. So has he factored in a recession? He laughs. He rules out any future heavy industrial activity on the land. The Zidells have invited culture on to its temporarily blank slate before now: drive-in movies, foodie events like Friday Night Feast, Cavalia the horse circus. Has anyone approached them trying to site a museum or cultural attraction, in the style of OMSIs adaptive reuse of the old power station? 1913: Russian immigrant Sam Zidell set up the Zidell Machinery and Supply Company in Portland selling equipment and supplies to the region's expanding industrial base. 1946: Sam Zidell's son Emery founded the Zidell Ship Dismantling Company, later Zidell Explorations and dismantled a total of 336 ships in 30 years. 1960: Emery Zidell founds Zidell Marine, barge maintenance and construction, to build barges from recycled steel. 2016: Zidell Marine and Tube Forgings of America headed by Emery's son Jay. ZRZ Realty Company, headed by Jay Zidells nephew Matt French.